Panorama is a centralized management system that provides global visibility and control over multiple Palo Alto Networks next generation firewalls through an easy to use web-based interface. Panorama enables administrators to view aggregate or device-specific application, user, and content data and manage multiple Palo Alto Networks firewalls-all from a central location. Large enterprises commonly have many firewalls deployed throughout their organization and more often than not, the process of managing and controlling them is cumbersome due to management complexities and inconsistencies between individual device and centralized management interfaces. The result is an increase in administrative efforts and associated costs. Panorama provides centralized management and visibility of Palo Alto Networks next-generation firewalls. From a central location, administrators can gain insight into applications, users and content traversing the firewalls. The knowledge of what is on the network, in conjunction with safe application enablement policies, maximizes protection and control while minimizing administrative effort. Administrators can centrally perform analysis, reporting and forensics with the aggregated data over time, or on data stored on the local firewall. Panorama shares the exact same web-based look and feel as the individual hardware and virtual form-factor firewalls, minimizing any learning curve or delay in executing the task at hand. Palo Alto Networks adheres to a management philosophy that emphasizes consistency, providing a significant advantage over competitive offerings. Panorama provides centralized policy and device management over a network of Palo Alto Networks™ next-generation firewalls. View a graphical summary of the applications on the network, the respective users, and the potential security impact. Deploy corporate policies centrally to be used in conjunction with local policies for maximum flexibility. Delegate appropriate levels of administrative control at the device level or globally with role-based management. 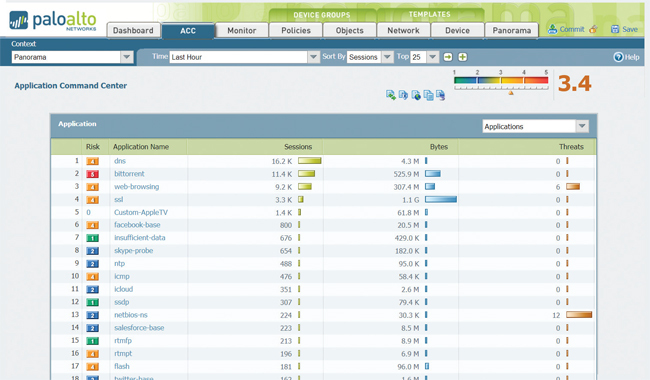 Centrally analyze, investigate and report on network traffic, security incidents and administrative modifications. Application Command Center (ACC): Provides a visual summary of application, web, threat and data transfer activity displayed in a straightforward, easy to understand manner. Administrators can quickly learn more about the network activity by adding and removing filters in ACC with a click of the mouse. App-Scope: Provides a comparative view of application activity (present vs. a past timeframe) across either multiple devices or a single device to help administrators pinpoint problematic network behavior. Policy-based application usage control: Using a policy editor with a familiar look and feel, administrators can develop, deploy and manage application usage control polices using a wide range of criteria such as: user and group, application, application category, application behavior or underlying technology. Shared policies: Deploy a set of global policies across a set of distributed firewalls. Local device administrators will be able to see these rules, but only a Panorama administrator can modify or remove them. Centralized Update Management: Customers can use Panorama to manage licenses and perform device or content updates (viruses patterns, threat signatures, App-ID). Application browser: Allows administrators to quickly research an application, its behavioral characteristics and underlying technology and then immediately translate the results into a security policy. Logging: Detailed logs are collected locally, leveraging device storage and eliminating the requirement for centralized logging. Logs can be dynamically filtered on individual fields as well as through regular expressions. Reporting: More than 30 predefined reports can be used as is or modified and saved for future use. Reports can be exported to PDF and scheduled for email delivery. Using Application Command and Control (ACC) from Panorama provides an administrator with a graphical view of application, URL, threat and data (files and patterns) traversing all Palo Alto Networks devices under management. ACC dynamically fetches data from each device to ensure that administrators have an up-to-date view of the applications on the network, who is using them, and the potential threats they may pose. Administrators can investigate new or unfamiliar applications with a single click that displays a description of the application, its key features, its behavioral characteristics, and who is using it. Additional data on URL categories and threats provides a complete and well-rounded picture of network activity. The visibility from ACC allows administrators to make informed policy decisions and to respond quickly to potential security threats. complete with drill-down to learn more about current activity. Safely enabling applications means allowing access to specific applications with specific threat prevention and file, data, or URL filtering policies applied. Panorama facilitates safe application enablement across the entire network of firewalls by allowing administrators to manage rules from a central location. Panorama-based shared policies help ensure compliance with internal or regulatory requirements while local device rules maintain both security and flexibility. Combining centralized and local administrative control over policies and objects can help strike a balance between consistent security at the global level and flexibility at the local level. Administrators can deploy policies that safely enable applications or application functions based on users via directory services integration while application-specific threat prevention protects the contents and the network. The ability to set a single policy that safely enables applications based on user-not IP addresses-allows organizations to dramatically reduce the number of policies required. An added benefit of directory services integration is a dramatic reduction in administrative overhead associated with employee adds, moves and changes that may occur on a day-to-day basis - security policies remain stable while the employees are moved from one group to another. Panorama utilizes the same set of powerful monitoring and reporting tools available at the local device management level and adds visibility by providing an aggregate view of activities. As administrators perform log queries and generate reports, Panorama dynamically pulls the most current data directly from firewalls under management or from logs forwarded to Panorama. Access to the latest information across all devices allows administrators to address security incidents as well as take a proactive position to protect corporate assets. Log Viewer: For either an individual device, or all devices, Panorama administrators can quickly view log activities using dynamic log filtering by clicking on a cell value and/or using the expression builder to define the sort criteria. Results can be saved for future queries or exported for further analysis. Custom Reporting: Predefined reports can be used as-is, customized, or grouped together as one report in order to suit specific requirements. User Activity Reports: From Panorama, a user activity report shows the applications used, URL categories visited, web sites visited, and all URLs visited over a specified period of time for individual users. Panorama builds the reports using an aggregate view of user's activity, no matter which firewall they are protected by, or which IP or device they may be using. Log Forwarding: Panorama can aggregate logs collected from all your Palo Alto Networks firewalls, both physical and virtual form factor, and forward them to a remote destination for purposes such as long-term storage, forensics or compliance reporting. Panorama can forward all or selected logs, SNMP traps, and email notifications to a remote logging destination such as a Syslog Server (over UDP, TCP or SSL). Templates: Panorama manages common device and network configuration through templates. Templates can be used to manage configuration centrally and then push the changes to all managed firewalls. This approach avoids making the same individual firewall change repeatedly across many devices. One example of such use is to push common DNS and NTP server settings across hundreds of firewalls, rather than performing the same change on a device by device basis. 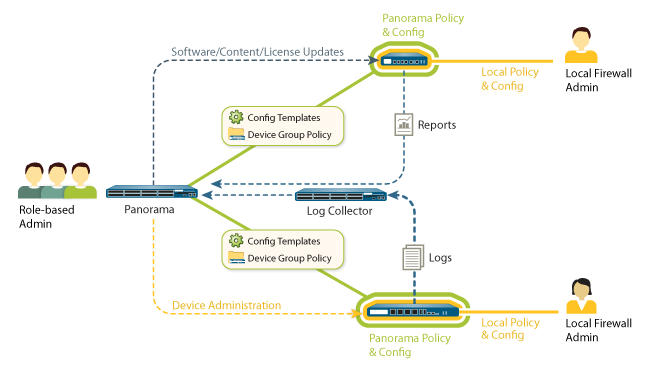 Device Groups: Panorama manages common policy and objects through device groups. Device groups are used to centrally manage the rulebases of many devices with common requirements. Examples of ways to group devices in device groups may be geographically (e.g., Europe and North America) or functionally (e.g., perimeter or datacenter) oriented. Within device groups, virtual systems are treated as individual devices, at the same level as physical firewalls. This allows common rulebase sharing across different virtual systems on a device. You can use shared policies for central control while still providing your local firewall administrator with the autonomy to make specific adjustments for local requirements. At the device group level, you can create shared policies that are defined as the first set of rules (pre-rules) and the last set of rules (post-rules) to be evaluated against match criteria. Pre- and post-rules can be viewed on a managed firewall, but can only be edited from Panorama within the context of the administrative roles that have been defined. Local device rules (those between pre- and post-rules), can be edited by either your local firewall administrator, or by a Panorama administrator who has switched to a local firewall context. In addition, an organization can use shared objects defined by a Panorama administrator, which can be referenced by locally managed device rules. Role-based Administration: Organizations can use role-based administration to delegate feature level administrative access (enabled, read-only, or disabled and hidden from view) to different staff members. Specific administrators can be given appropriate access to the tasks that are pertinent to their job while making other access either hidden or read-only. An example of how this type of access control could be used is to define different roles for personnel responsible for different tasks across the enterprise, such as the security admins versus network admins. All changes made by an administrator are logged, showing the time of occurrence, the administrator, the management interface used (Web UI, CLI, Panorama), the command or action taken. Software, Content and License Update Management: As a deployment grows in size, many organizations want to make sure that updates are sent to downstream boxes in an organized manner. For instance, security teams may prefer to centrally qualify a software update before it's delivered via Panorama to all production firewalls at once. Using Panorama, the update process can be centrally managed for software updates, content (application updates, antivirus signatures, threat signatures, URL filtering database, etc) and licenses. Using templates, device groups, role-based administration, and update management, organizations can delegate appropriate access to all management functions; visualization tools, policy creation, reporting and logging at both a global level as well as a local level. Organizations can deploy Panorama either as a hardware appliance or as a virtual appliance. device groups, role-based administration, as well as update management. Distributed: An organization may prefer to separate the management and logging functions across multiple devices. Under this configuration, the functions are split between managers and log collectors. Panorama Manager: The Panorama manager is responsible for handling the tasks associated with policy and device configuration across all managed devices. The manager does not store log data locally, but rather uses separate log collectors for handling log data. The manager analyzes the data stored in the log collectors for centralized reporting. The separation of management and log collection enables organizations to optimize their deployment in order to meet scalability, organizational or geographical requirements. Centralized: All Panorama management and logging are consolidated into a single virtual appliance (with the option for high availability). Distributed: Panorama distributed log collection supports a mix of the hardware and virtual appliance. Panorama Manager: The virtual appliance can serve as a Panorama manager, and is responsible for handling the tasks associated with policy and device configuration across all managed devices. Panorama Log Collector: Panorama log collectors are responsible for offloading intensive log collection and processing tasks, and may be deployed using the M-100. The virtual appliance may not be used as a Panorama log collector. Providing the choice of either a hardware or virtualized platform, as well as the choice to combine or separate the Panorama functions, provides organizations with the maximum flexibility for managing multiple Palo Alto Networks firewalls in a distributed network environment. Globally managing multiple Palo Alto Networks next generation firewalls with Panorama or controlling a single device via the on-box capabilities is accomplished through a common web-based interface, eliminating the need to install a desktop client, while minimizing the learning curve for both interfaces. The result is that administrators can move from one management interface to another painlessly, allowing them to immediately take advantage of the provided multi-device capabilities.